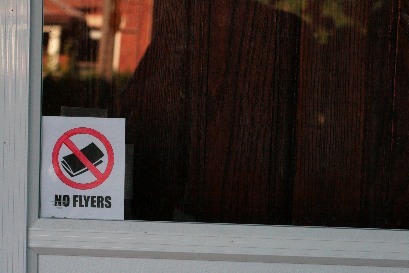 Summary: A printable sign to tell the world that you do not want flyers or advertising in your mailbox. 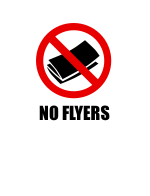 I wanted to put up a sign to stop junk mail, but I all the ones I found online were ugly, unclear or were advertising something else. While visiting Montréal, I noticed that many houses had a wonderful little piece of design to indicate that they did not want any flyers. Taking this design as inspiration, I created my own sign. And, just like my storyboard templates, there is no text or annoying credits. It's just a sign that communicates a simple message. No fluff. If you are a fancy pants with a colour laser printer, then print out the colour version. For mere mortals with normal laser printers, print out the b/w version and colour in the circle and cross with a pencil crayon or marker. Forget ink jet: It will fade quickly in the sun and smudge if it gets even slightly wet. 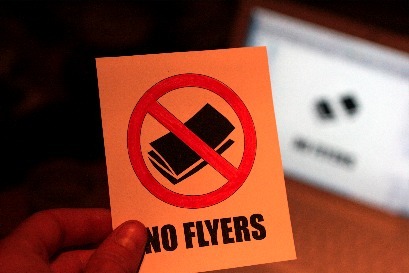 You can print onto sticker stock, or just use regular paper and tape. If your mailbox gets a lot of rain, cover the whole surface in clear packing tape. How large to print? The sign should be able to be read from the curb. The default size is quite large (about a quarter of an 8.5x11 or A4) so I scaled it down to 70% when printing. Print a storyboard template - useful for animation, films or any project that combines visuals over time.